Dogs are man’s best friend, but when it comes to real estate transactions, they can bring headaches you’d probably rather avoid. Your pet may be as close to you as any family member, but it’s important to remember that when you’re buying or selling a home, your dog should stay as behind-the-scenes as possible. This is because having pets can make selling a home more difficult to certain buyers; many people are put off by a pet-friendly home–even if it’s in great condition–because of the fear of odors or damage. Not only that, but when it comes time to buy a house, you’re better off leaving your dog at home or in the capable hands of a friend or loved one rather than bringing him along. The homebuying process can be a long, tedious one, and it’s best not to make it any more complicated than it has to be. It can be tricky to maneuver through any real estate transaction with a pet to think about, but below you’ll find tips on how to do just that. Cleaning up your space is imperative when your home will be up for sale and open to potential buyers for showings, but it can be difficult to see your home as it really looks when you’re in it every day. One thing you can do to assist in finding areas that need attention is to move your furniture around. Being able to see each room in a different way–and moving pieces away from walls–will help you find spots that need to be cleaned or spruced up. Also, this is a great way to give your home a fresh look without spending money. It’s also important to take a good look at your yard. 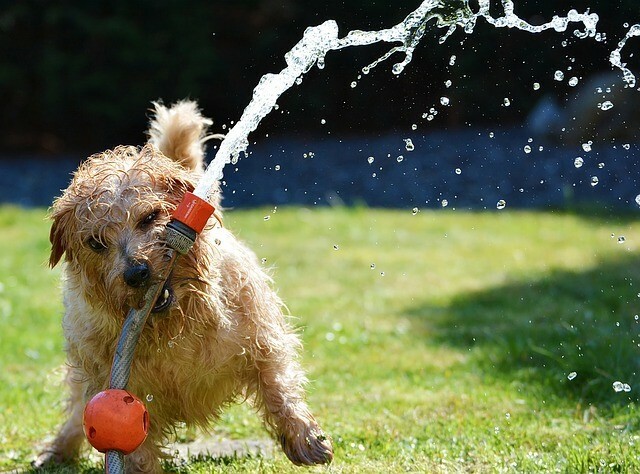 Curb appeal is one thing, but your backyard may need work as well, especially if your dog spends a lot of time there. Look for spots that have been dug up and need filling in, or get rid of that run-down doghouse. Giving your yard a clean, simple look will allow potential buyers to see their own ideas come to life. Moving–and all the changes that come with it–can be hard on dogs, and they may behave differently or more aggressively than usual. Therefore, it’s important to make sure your pet is kept away from visitors to your home; consider keeping him in a kennel or crate, or asking a friend to watch him during open houses. Better yet, find a few fun places to bring your dog along to in town and have a little date. In Auburn, there’s Katrina’s where you can get breakfast all day and The Fat Rabbit in nearby Folsom if you want to grab a bite or a brew, or you can head to Ashley Park to get a little exercise while you wait for the showing to end. The moving company you choose to work with is extremely important, as you’ll be trusting your big day with them. Keep lines of communication open and talk to them about your pet and any rules you have about interactions and where he should be. Let them know your plan for the day; for instance, if your dog will be in a crate or closed up in one room until the end of the day, the movers need to know that. Your pet may already be trained, but all the changes that buying and selling a home brings means your dog may need to brush up on his skills. Go over some basic commands with him at home to ensure he knows how to mind his manners when you do have guests. Moving can be an overwhelming task if you aren’t prepared, so plan well for your dog’s safety and your own peace of mind; this way, everything will go smoothly.